Why can't I click on a report universe to create a new report in Manage Report Universes? Currently the ability to create a new report using the universes listed under Manage Report Universes is not available with BO 4.2. 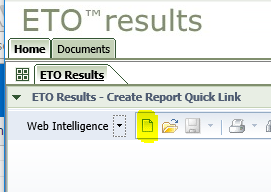 To create a new report, first click on Reporting Dashboard within ETO to launch an ETO Results Web Intelligence page. Within the Web Intelligence page, click on the create a new document icon and select the Universe data source. The universe name will be preceded by the enterprise name, for example, etoclient123Newname Universe. For more information on report universes click here.